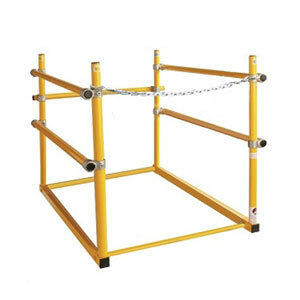 OSHA Safety railing system for 30"x30" roof access hatch. Price/system. (aka HR3838, SHWC-3030). Roof access hatch, 30 wide x 30 inch long opening, High Reflectance Brite WHITE color, 14 gauge galvanized steel cover, frame & self flashing base. Made in USA Babcock-Davis. Price/Each.